UNITED NATIONS (AP) — Fuel is being shipped illegally from Iran to Houthi Shiite rebels in Yemen to finance their war against the government, and both sides are violating international law with their military campaigns and arbitrary detention of rivals, U.N. experts said in a new report. The experts painted a grim picture of a “deeply fractured” country sliding toward “humanitarian and economic catastrophe” with no sign of victory by either side in a conflict that many view as a proxy war between regional rivals Saudi Arabia and Iran. The conflict in Yemen began with the 2014 takeover of the capital Sanaa by the Iranian-backed Houthis, who toppled the government of Abed Rabbo Mansour Hadi. A Saudi-led coalition allied with Hadi’s internationally recognized government has been fighting the Houthis since 2015. The fighting in the Arab world’s poorest country has taken a terrible toll on civilians, with thousands killed and a catastrophic humanitarian crisis underway. Millions suffer from food and medical care shortages and the country has been pushed to the brink of famine. In its report last year, the experts said Iran violated a U.N. arms embargo by directly or indirectly providing missiles and drones to the Houthis. The latest report said the experts identified a small number of companies inside and outside Yemen operating as front companies using false documentation “to conceal a donation of fuel” to an unnamed individual on the U.N. sanctions blacklist. 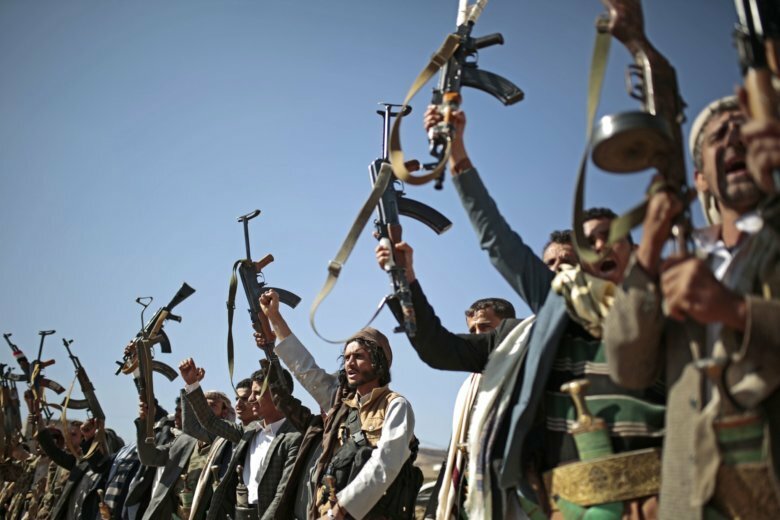 Iran has repeatedly rejected allegations that it is providing military support to the Houthis. In one case, they said, the Houthis targeted a vessel carrying wheat, which endangered the delivery of humanitarian aid and raised shipping costs to Yemen. The Houthis also attacked and damaged two Saudi oil tankers, each carrying 2 million barrels of crude oil, which “could have created an environmental disaster in the Red Sea,” the experts said. Since about last August, the panel said it noted the Houthis’ deployment of extended range drones that would allow rebel forces to strike deep in Saudi Arabia and the United Arab Emirates, a key coalition partner. “Based on the evidence available, the panel observes that unlike in 2015 and 2016 when the Houthi forces used complete or partially assembled weapons systems which were supplied from abroad … they are now increasingly relying on imports of high value components which are then integrated into locally assembled weapons systems,” the experts said, adding that they are investigating whether the rebels were helped by foreign experts. During 2018, the panel said, there had also been “widespread violations” of international humanitarian and human rights law by the government-backed coalition and the Houthis. The panel said it investigated five airstrikes in 2018 that affected civilians and civilian buildings and infrastructure and left a total of 78 people dead and 153 wounded. It found the coalition responsible for three airstrikes — including the April 22 bombing of a wedding party in northern Yemen that killed 21 people including the bride and wounded approximately 90 — and likely responsible for a fourth. The experts also found the coalition responsible for the Aug. 2 mortar bombing of a hospital and fish market in the port of Hodeida that killed 55 people. “Even where precautionary measures were taken, they were largely inadequate and ineffective,” the panel said.